Bosch packaging machines for secondary packaging include machines for Wraparound boxes, RS-boxes and machines for tray or tray and hood. The output for the case packers is up to maximum 80 cases/min. 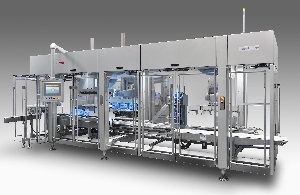 Bosch also deliver toploaders for chocolate bars and tabs, biscuit packages, cheese products, bags, for dairy products and for products from the pharmaceutical- health- diagnostics- and cosmetic industry.